Norman Rockwell was one of America’s foremost artist illustrators. He once commented on not having an idyllic life and how this affected his work. “Maybe as I grew up and found the world wasn’t the perfect place I had thought it to be, I unconsciously decided that if it wasn’t an ideal world, it should be, and so I painted only the ideal aspects of it.” Rockwell’s “perfect world” was created in the paintings of small-town America that graced the covers of The Saturday Evening Post Magazine for five decades. And the models for those paintings were his friends and neighbors in the town of Stockbridge, Massachusetts, nestled up in the Berkshire Hills. 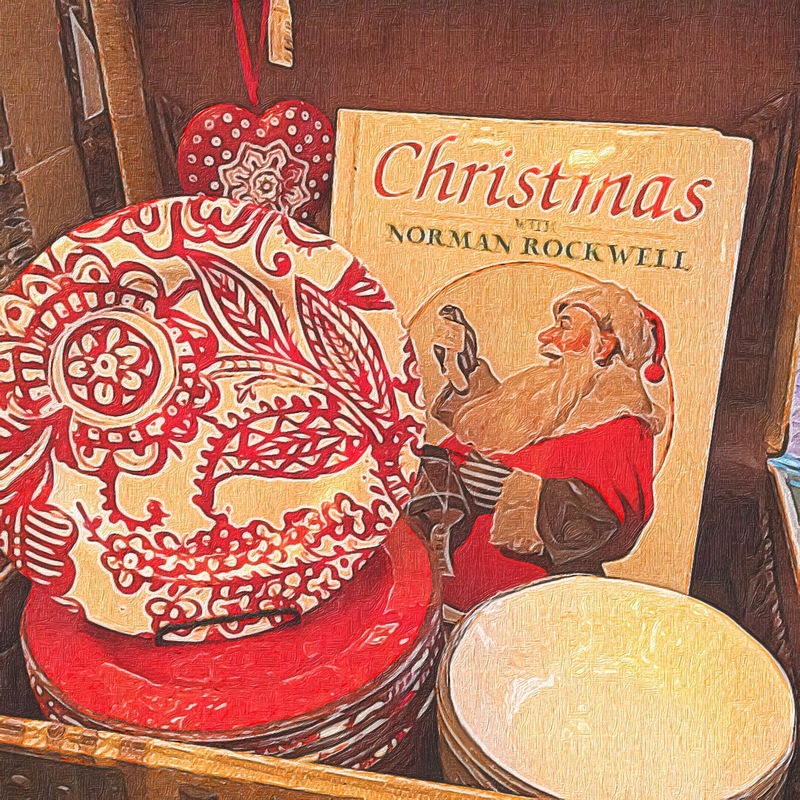 Every year during the first weekend in December, Stockbridge honors their favorite son by hosting the Norman Rockwell Weekend. He lived there from 1953 until his death in 1978 and his studio was in the center of town overlooking Main Street. Charley and I decided to enjoy the festivities last weekend while shooting some photos for the next book in the ZuZu Series which will be a Christmas Tale. We arrived on Friday evening and headed for the General Store where a kind woman named Theresa led us up stairs to unlock the studio where Rockwell worked from 1953-1957. I needed to get a picture from the inside looking out. Now, it’s an empty room with just a Christmas Tree set up in the window. But I could imagine Rockwell there, arranging his local models into the poses that became so familiar to Americans when I was growing up. After taking a few more pictures inside Williams and Sons Country Store, we walked along the street, looking in store windows and stopping at the Red Lion Inn to chat with the women in the gift shop. Both of these gift shops and the ones at Tanglewood and the Botanical Garden are places which graciously have been carrying A Berkshire Tale since it was published. Then we headed to The Garden Gables Inn. The fireplaces were roaring, freshly baked chocolate chip cookies and hot coffee were out on the side board and Jayne was there at the door to greet us. That night, we sat in front of the fireplace and made plans for the weekend. On Saturday, our first stop would be the Berkshire Botanical Garden where there would be home-made crafts and wreaths on sale and free mimosas to sip while strolling through the market tents. We had purchased tickets for the tours of historical houses decorated for the holidays and planned on spending Saturday afternoon soaking up a bit of local history. 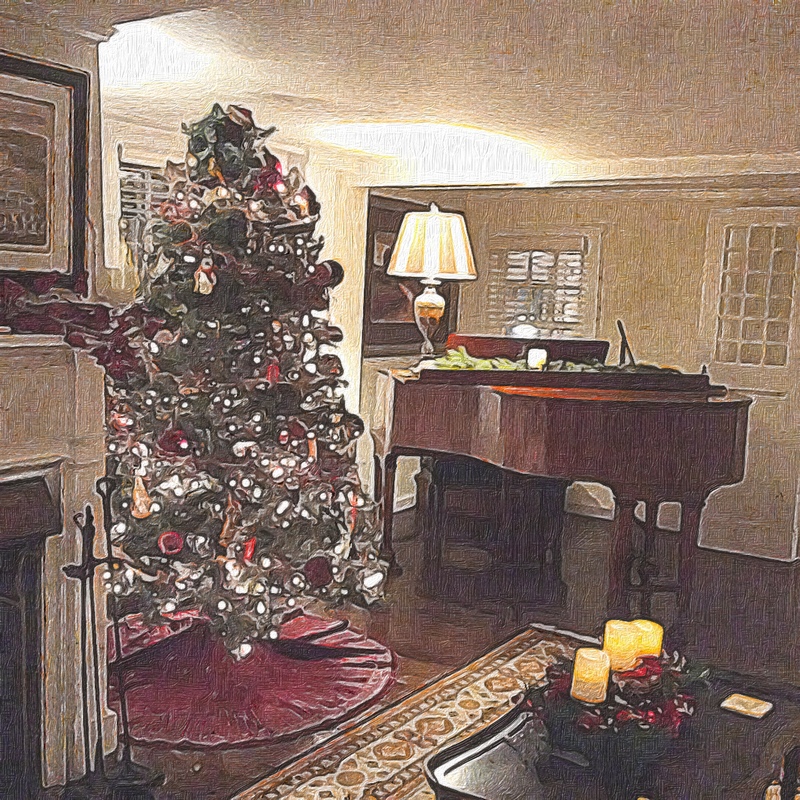 Later, we would have dinner at a cozy bistro, Once Upon a Table, before attending the caroling on the porch of the Red Lion and after that, we had tickets for a concert at the Stockbridge Congregational Church. It promised to be a very old-fashioned celebration indeed! On Sunday we would attend the morning church service and then on to Main Street to experience the town’s recreation of Rockwell’s famous painting, Home for Christmas, 1967 complete with antique cars, horse-drawn wagon rides, Roger the Jester, face painting, a high school jazz concert at St. Paul’s Church and carolers. Mr. and Mrs. Claus were scheduled to arrive by fire truck and spend time with those who wanted to whisper their Christmas dreams in Santa’s ear. What a lovely weekend! That type of Christmas cheer and old fashioned celebrations sure beats the malls. Marty, Rockwell rented that studio from 1953-1957. 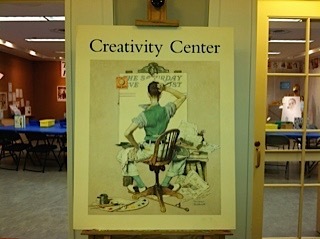 A studio was built on the grounds where the Norman Rockwell Museum is now and that is where he worked until his death. In his last years, he was struggling with dementia and he would be brought to his studio where he worked cleaning brushes and straightening, but he did not paint. The original studio over the Stockbridge General Store is rented out, There is the large room, a bedroom and a small kitchen and bathroom. It was vacant and so I was able to arrange to take some photos for my next book in the ZuZu Series which will be set during Norman Rockwell Weekend. And yes, it is cold and they were expecting snow on Monday. It can get quite deep which is very frustrating for little ZuZu. Pinned some, and G+ ‘d. This is gorgeous! And so are the pix of the town! lol Why booties at Whitney House? Was poor Roxie left at home again???? Dearest Lucy, Whitney House is now a private Home. It once was a Stagecoach Inn. The booties are to keep the mud out of the old wood floors and the carpets. They were expecting a few hundred people that day. We were early birds, so the crowds were not too bad. And yes, we are still hearing about leaving Roxie behind. She is demanding to write another post about the trauma of it all. Live, Ethel. Thanks, Ethel! Poor baby, Melinda’s liddle snook ‘ums. I demand her human rights!! Melinda’s widdle snookums has been screaming about free will for the last two weeks, since the teeth extraction fiasco. I am not getting her started on cat rights until she learns how to stop behaving like an animal! I’m fascinated by the pictures, which must be photographs with an oil painting finish. Am I right – and if so is this done in printing and developing the old fashioned way using screens or a setting on the camera? Either way they are very effective. What a wonderful weekend! Thank you for sharing. You had a wonderful vacation. Thank you for bringing us along to enjoy the weekend – great photos of a lovely adventure. They’re getting me through the season, Clive! I’m still not watching the news. I think we all need some respite from the news at present. Hopefully the festivities can take our minds off it. we’re in count down mode(one weeek to moving!). But LOVED this post and your magical pictures. You really captured the parts of Christmas I love so much! The first year we drove to the Cape 40+ years ago we stayed in Stockbridge. I loved it. I know the pictures will be wonderful in your Christmas Zuzu tale. Jo, I’m back to a semblance of “normal” now and look forward to spending time reading your posts. I know how busy you’ve been and that Doug is scheduled to be operated on in two weeks. He’s in our prayers. I truly love the look of your new house and that cashmere tree will be truly stunning wherever you decide to place it. Only one word for your holiday weekend-perfect. Thanks for allowing me to tag along. Goodness! I’m quite giddy with all those wonderful pictures …. what a wonderful working weekend! Loved your weekend travelogue, with wonderful photos of small-town America holiday celebrations, decorations, & traditions. You & Charley look great! Merry Christmas, dear friends! What a charming place-I did not know this about the artist. I am sure you had a lovely time and thank you for sharing the beautiful pictures. Mmmhm, the Messiah really is Christmas. Well, it’s grey and drizzly here and unseasonably warm! I think it will change tomorrow and be colder but brighter. I hope so as I have a friend coming to stay and we want to go out walking. I have to get the local history book to the publisher during the week and then I can start organising for Christmas! By the way, I don’t blame you for still avoiding the news. Have a lovely holiday with Charley and the cats. Mary, It was a marvelous concert put on by Boston’s Handel and Haydn Society. The program explained the origin of standing during the Hallelujah Chorus. It seems King George was so taken when he first heard it, that he stood through the chorus and the end of the concert. So, his subjects were forced to stand. Some conductors feel it disrupts the performance, but some actually stop and let the audience applaud before continuing. You can choose to stand or not, depending on the director of that concert. We stood. I hope you have a lovely walk with your friend and a peaceful holiday. I love capturing a memory so that I can relive it later on at home. I was standing in front of that red car, waiting to take a photo, when the young fellow knelt down and asked his girl friend to marry him. I just kept on shooting and she jumped up, hugged him and then looked at the crowd that had gathered. Putting her arms in the air, she yelled out, “Eight years!” It was classic! Thanks for the lovely comment. Your post warmed my heart, brought a beaming smile to my face, and made me feel a deep connection to everyone, just as Norman Rockwell’s creations always have done for me. Thank you, Clare. Russ, I can just see that beaming smile! I’ve always loved his work and the Rockwell Museum in Stockbridge is awe-inspiring. His Civil Rights Paintings bring me to tears. Such a skilled artist who was not so good with interpersonal relationships. I understand why we both appreciate him. I’m heading over to your blog, now. What a lovely Christmas post full of sweet holidays happiness! You and your husband look so good! I truly got your Christmas fairy tale spirit! Thank you, I am editing my Christmas Special video episode yet, I will publish it next weekend right before Christmas to greet you and my other Friends! Hope you will like it. A teaser – it will be snowy walk with Ann…Hugs and best wishes! Your post made my day. I love the creations by Norman Rockwell and your pics are such a wonderful example of holiday spirit. Lovely post! such great pix and I liked the one of you all dressed up too. Claremary, this Wednesday will mark 52 weeks of the Senior Salon. Thanks for coming along for the ride. Fantastic! I’m glad I found you. Here’s to 52 more! Beautiful pictures Clare. What a lovely weekend you must have had. When I was a child growing up in Australia my American aunt used to send Christmas gifts and cards like your pictures. The snowy Christmases seemed so exotic to me while we sweltered in summer heat. Robyn – Place is always the biggest inspiration for me. I love settings. If you ever visit Bernadette at Haddon Musings, she does a piece on women and her last one was about a female drummer in a big band during the war years. I contribute a post to her Senior Salon sometimes on Wednesdays. I’ll go and visit her. Thanks Clare. Hopefully, I’ll see you there on Wednesdays! I don’t even try to type on my phone. It would be mishmash because I couldn’t see the letters and my fingers are too pudgy! Interesting about your aunt and your parents. I see a blog post or two in there. Hi, Andy. Charley and I have had a really good year. His cancer is in remission and we’re happy to have more time together. Something we were not sure of a few years ago. So, we’re very happy and thankful. He’s been wanting me to do a Christmas book and we were in Stockbridge to take some photos for ideas for the illustrator and to talk with the store managers who have A Berkshire Tale. I’m already marketing Christmas on Main Street – ZuZu’s Homecoming and it won’t be out until next September! Self publishing has many facets, but you know that, I’m sure. The photo is of the Christmas Tree in Rockwell’s studio window. It will be a picture in the book with the kitten under the tree looking out onto Main Street at the Festivities. The cover will be from the outside, looking up at the kitten under the tree sitting in the window at night with snow falling on Main Street. The photos came out well and Zach, the illustrator, will have lots of ideas to work with. When we went on the historic house tours, a woman in the gift shop at Ventfort Hall showed interest in carrying the book. So, it was a festive and a productive weekend all around. I know that the celebrations in China will be for the New Year. When Shengdong and Milanda were here, we had an American Christmas for them and they loved it. We decorated a real tree, hung stockings by the fire, unwrapped gifts, made gingerbread cookies, had a turkey dinner and went to the midnight candlelight service at church. Milanda still talks about it. When we Skype, they enjoy hearing about the things we’re doing for the holidays. Charley and I decorate and play Christmas music all of December. Roxie hates all the changes around the house and she’ll probably write about it next week. Hiya Clare. Oooooo you’re making me feel festive. Zu Zu’s home coming sounds great. Count me in 🙂 Yes it has been a while. I think I’ve not been able to find a spare second lately to do anything. I was thinking How on earth did I ever write all of those books and then I remembered, I didnt have a blog at all or do anything on social media while I was writing. I guess that’s the ticket. Glad you’re enjoying the YouTube. If you havent already pls subscribe as its so slow getting it off the ground. Still really enjoyable though. I am very warm today as am off work sick which is why I’ve got the time to drop by and say hello to my ol’ mate 🙂 What does Roxie think of the Christmas tree though? Roxie is ignoring the trees, at the moment.It’s the manger scene and the snowmen that bother her the most as they are in her settling places. Every so often she swats at one of the figures in hopes of it crashing to the ground and breaking. Then she looks up innocently as though she has no idea how it all fell apart. I’m only vaguelly-familiar with Norman Rockwell’s work, Clare, but your photos are lovely and it looks like you had a great weekend. The phrase ‘Small town America’ always conjures up, in my mind, the movie Pleasantville. Have you seen it? Thanks, and you. – Happy Christmas. Hello, Lori. Are you snowed in? I’ll visit your site to find out. Thanks, and a very prosperous New Year is wished for you, too! Thank you. We have had snow off and on. It’s is so cold! Lori, I’m so happy I went to your blog. That baby is absolutely beautiful and your Christmas sounded truly peaceful. Thanks for sharing this wonderful Christmas trip. It is like the fantasy of the perfect Christmas that lots of us have, but rarely experience. Great photographs! Thank you. I really enjoy the Berkshires and have used the area as a setting for the ZuZu stories. And I love to take photos and use the brushstroke App to make them look like illustrations. I haven’t been blogging for a month due to much Hustle and Bustle, butI thank you for stopping by and I’ll be visiting you right after this.